Avoid wearing make-up and moisturizer - they act as a barrier to the solution and stop the process from working properly. Avoid wearing deodorant. Shave at least 8 hours before your tanning appointment. Wax a minimum of 24hrs before your appointment. Do not use Dove products, including Dove deodorant. 1. Wait a minimum of 8 hours before washing . 12-24 is best. 2. Apply moisturizer daily, morning and evening after your post tan shower. Bronzing 4-Faces Norvell's Award Winning Spray Tanning Solution in an easy-to-use pump spray. Ideal as a self tanning touch-up spray and facial tanner. Color Extending ProLong Make it last! Norvell's best-selling daily sunless moisturizer extends and builds color between sessions. Pre Tan Body Buff eXmitt Short on time? Use eXmitt body-buff to slough away dead skin cells, remove makeup and cleanse the skin immediately before your self-tanning application. No water, no rinsing required. All sizes TSA Approved for carry-on luggage. Done by a trained professional, by hand, in a private room in our salon. This is not to be confused with the booth, Mystic Tan! The application process takes about 10-15 minutes and then you're on your way to a beautiful, natural looking tan! We have many different shades to compliment all skin tones, and guarenteed to not turn you orange! 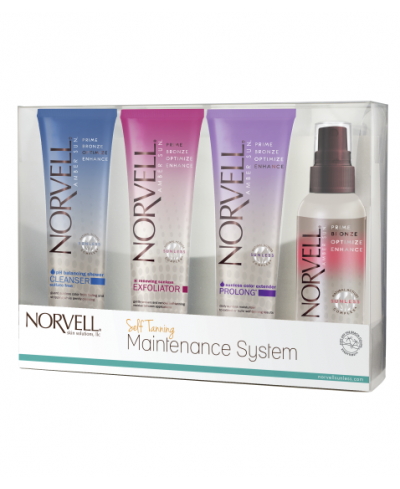 With proper preparation and care with Norvell Maintenance kits, your tan can last up to 10 days! We have a special room designed with a platform for you to stand on and spotlights for great lighting for the technician to get your tan perfect!